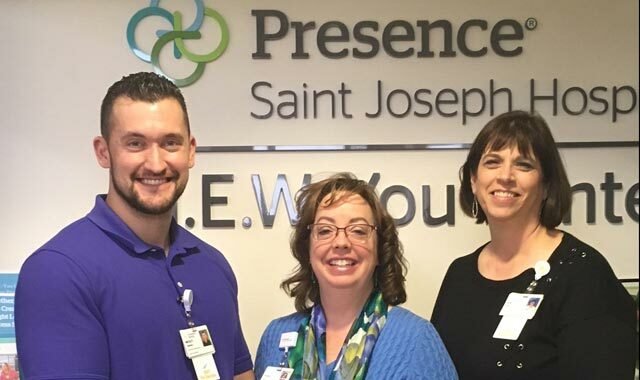 Presence Saint Joseph Hospital-Elgin’s staff at the N.E.W. You Center works closely with each patient to build a treatment plan. Presence Saint Joseph Hospital-Elgin has launched a new, interactive way to lose weight and maintain a healthy diet. The N.E.W. You Center hosts several innovative wellness programs that emphasize nutrition, education and wellness. The staff works closely with you to build a plan tailored to your weight loss goals, which will help you on your journey to improved health. “This program is designed for people to lose weight and feel healthier,” says Dr. Anandita Gephart, medical director of the N.E.W. You Center. The programs include weekly professional coaching, weight loss management meetings with staff members, and a complimentary 12-week Y-FIT program membership at the Taylor Family YMCA in Elgin. Once you attend a free community workshop, you can select which weight loss program is best for you. One option is the Ideal Protein method, which is a natural and effective weight loss plan. This program combines partial replacement meals and snacks, such as shakes, along with your protein and vegetables. With this protocol, you receive personalized support from a certified coach, maintain a daily journal and outline your food intake in a program workbook. The second program option is CORE 4, a 12-week adult group weight management program that provides guests with knowledge and tools needed to successfully manage their weight. The program includes three one-on-one dietitian sessions, nine weekly group workshops, metabolic and cholesterol screen-ings, and weekly goal setting and progress updates. “What I really needed was guidance,” he says. Perrin, who has arthritis in his back and left hip, was having a hard time working out. But with this program, he was able to exercise in the swimming pool with a class geared for people who have arthritis. He uses a workbook to track his weight loss and the food he eats. “There were 12 people in the class, and everyone would set weekly goals and we would talk about our experiences,” Perrin says. He was 397 pounds when he started the program and lost 25 pounds in just 12 weeks. The N.E.W. You Center has recently introduced a new 14-day Jump Start program. With this program, participants receive three one-on-one, in-person consults with a member of their expert team, day-by-day meal plans, select meals/snacks to supplement store purchased veggies and proteins, and tailored exercise guidelines. For more information on any of the N.E.W. You Center’s programs, call (847) 622-2080 or visit presencehealth.org/NEWYou. A new, non-invasive diagnostic and treatment device is now working side-by-side with traditional acupuncture at Nature’s Balance Acupuncture & Wellness Center, 802 E. Terra Cotta Ave., Ste. 101, Crystal Lake. Nature’s Balance specializes in acupuncture therapy, a technique based in traditional Chinese medicine that involves stimulating specific points on the body to restore the body’s natural healing ability. Now, it’s employing the ONDAMED device to enhance acupuncture’s effectiveness while speeding up the healing process. ONDAMED technology creates a painless, pulsed electromagnetic field (PEMF) based on signals obtained from your body’s autonomic nervous system. This electromagnetic field penetrates deep into the desired area of the body to assist in healing without pain or needles. Nature’s Balance has built its practice on using techniques such as acupuncture, massage, herbs, ONDAMED and other treatments to help patients feel and look their best. Jozwiak opened the clinic in July 2007 with a goal of helping others achieve optimum health. Over the past decade, the clinic has helped more than 3,000 patients to realize their health goals. During the ONDAMED treatment process, PEMF applicators, similar to a necklace or belt, are placed on targeted areas of the body. Through the use of magnetic frequencies, ONDAMED balances and supports targeted organs, glands and cells. The hourlong treatment is not only painless, but it’s relaxing to the point where people often fall asleep during their session. ONDAMED offers plenty of benefits for enhancing wellness and healing conditions both acute and chronic. It can help to promote circulation, relieve pain and discomfort, support healing from sports injuries and detoxify the body, among other things. Other services at Jozwiak’s clinic include massage therapy, nutrition and weight-loss therapies, thermography and infrared sauna therapy, which uses heat and light to detoxify the body and relax the nervous system. Nature’s Balance also performs Mei Zen Cosmetic Acupuncture, which is a natural alternative to plastic surgery, facelifts and other cosmetic treatments. This procedure brings increased energy and blood to the face and can improve or increase the production of collagen and elastin – a protein found in the skin and connective tissues. “This helps to tighten and tone the face and neck, which reduces fine lines and wrinkles,” Jozwiak says. Jozwiak may have her education in a medicine that is thousands of years old, but she remains active in seeking new therapies that can help her patients by delivering results. Nature’s Balance serves people all around the McHenry County area. For more information or to make an appointment for a comprehensive health evaluation, call (815) 788-8383. This entry was posted on Tuesday, May 1st, 2018 at 11:58 am	and is filed under Health & Fitness. You can follow any responses to this entry through the RSS 2.0 feed. Both comments and pings are currently closed.